A decade ago, Jake Delhomme was part of the first team John Fox took to the Super Bowl as a head coach. But the 2003 Panthers were far from a record-smashing powerhouse. At the time, they were the most unlikely team ever to play for a championship — a group closer to average than great, and one that needed more than a little luck to get to Houston. Including the playoffs, Carolina played in five overtime games that season. Fourteen of its 20 games were decided by a touchdown or less. The Panthers’ penchant for late-game craziness brought with it, as memorable runs can, a nickname for the team. They were the Cardiac Cats, and they were nothing if not exciting — all the way till the end. That Super Bowl, one last-second field goal from overtime game no. 6, was one of the best ever, but it also helped bring the NFL into the modern world. Janet Jackson’s halftime gaffe was a collective Internet moment just as those had become possible. Like any historical touchstone, those Panthers featured names that serve as a thread from then to now. 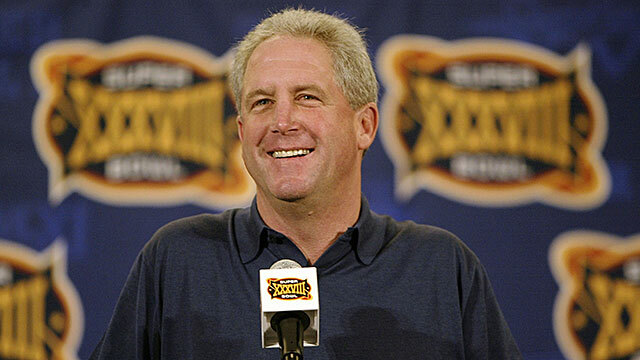 Carolina was Fox’s first stop as a head coach, and his work there was such that he lasted just one year away before ending up in Denver. The Panthers’ quarterbacks coach was Mike McCoy, who later parlayed his year as Peyton Manning’s offensive coordinator to become head coach in San Diego. Steve Smith and Jordan Gross — young, promising pieces a decade ago — played a part this season as aging veterans in the Panthers’ franchise resurgence. The Super Bowl itself sparked a decade-long run of great championships after a stretch during which a memorable finish was considered an exception. That a game of such importance to modern NFL history would involve the Patriots isn’t a surprise. Tom Brady and Bill Belichick are the modern NFL, and Super Bowl XXXVIII cemented them both. The Panthers, though, were about as far from NFL royalty as you could get. Eight years removed from being an expansion team, two years removed from a 1-15 season, led by a second-year head coach, and quarterbacked by an undrafted, Cajun-born veteran of NFL Europe, no one expected them to nearly join a list featuring some of the greatest teams ever. 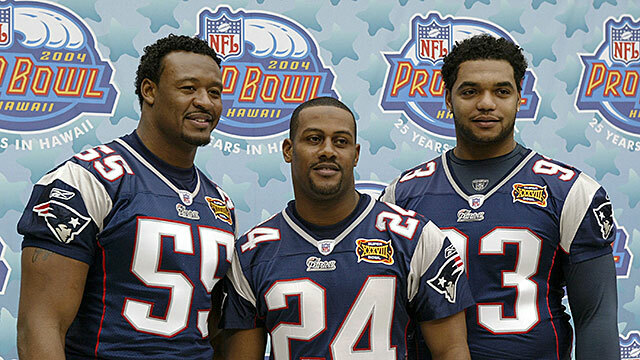 In a way, the 2003 Panthers started back in the 2001-02 season, with a loss, funnily enough, to the Patriots. This defeat came on January 6, 2002, in a cleared-out Ericsson Stadium, where Tom Brady’s team smoked Carolina, 38-6, on its way to the Super Bowl. The loss was Carolina’s 15th in a row. “The energy has been sucked out of our organization and our fan base,” owner Jerry Richardson said at the time. “We’ve lost 15 in a row; we were 31st in the league in offense and 31st in defense. It couldn’t continue. I had to make a change.” That meant firing head coach George Seifert and replacing him with Giants defensive coordinator John Fox, who’d never been a head coach at any level. That 1-15 record gave the Panthers the second overall pick in that spring’s draft. 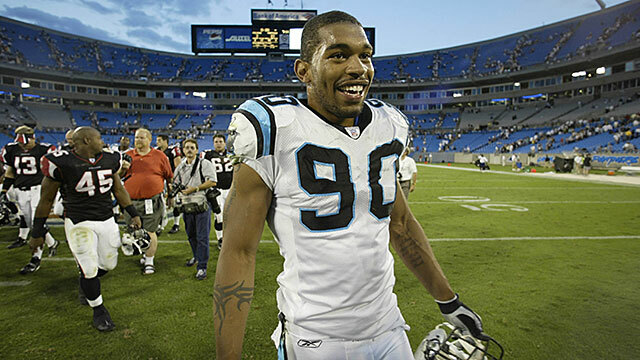 They selected North Carolina native and local-school phenom Julius Peppers. With 12 sacks as a rookie, Peppers was the final piece of a Panthers front four that might have been the scariest in football. Mike Rucker was a double-digit sack candidate across from Peppers, and between them sat Kris Jenkins — a first-team All-Pro, modestly listed at 335 pounds. Fox was building his team, defense first — and it worked. In his first year, Carolina went from 21st in defensive DVOA to third. On offense, things were still a mess. Carolina finished 30th in scoring offense in Fox’s first season, and the 2003 offseason was spent retooling the most important spots on the roster. The Panthers spent the eighth overall pick on Jordan Gross (who just went to the 2013 Pro Bowl at age 33). They signed former Redskins running back Stephen Davis, who’d tallied three 1,300-seasons in Washington. Steve Smith, their dynamic kickoff and punt returner, was slated for an even bigger role in the offense. Quarterback was still a question. Rodney Peete, at age 36, had taken over for the oft-injured, ineffective Chris Weinke the season before, and Peete entered the 2003 season as the Panthers’ starter. For a bit of insurance and competition, Carolina signed a former Saints backup named Jake Delhomme. Delhomme’s Louisiana accent is as thick as you remember — maybe thicker. His family wasn’t made up of the fishing or hunting type of Louisianans. His grandfather bred quarter horses, and to this day, Delhomme still spends much of his time raising and racing horses. He attended the University of Southwestern Louisiana (now the University of Louisiana at Lafayette), where he led the Ragin’ Cajuns to two conference titles. When the draft came, Delhomme’s name went uncalled. He spent his first season on the Saints’ practice squad, but was eventually sent to the Amsterdam Admirals of NFL Europe, where he backed up a former Arena League quarterback named Kurt Warner. Three years his junior, Delhomme looked up to Warner. He admired his lack of conscience as a quarterback, how interceptions never deterred him. “He was always attacking,” Delhomme says. Even in Warner’s second MVP season, he threw 22 interceptions. It was a style Delhomme took with him. When the Panthers’ quarterback competition ended with that ’03 preseason, Peete was the winner, but it was close enough that the ground under his feet was never too secure. The Panthers’ season opener that year was at home against Jacksonville, and it took two quarters for Fox and offensive coordinator Dan Henning to realize they’d made the wrong decision. Peete finished the first half 4-of-10 for 19 yards, and as the Panthers made for the locker room trailing 14-0, they were met with boos. When they got inside, quarterbacks coach McCoy came up to Delhomme and told him he was going in. Three touchdown passes and a 24-23 win later, the Panthers were 1-0, and Delhomme was their starting quarterback. 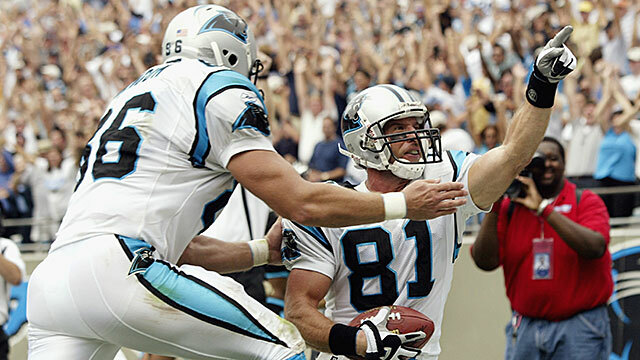 Delhomme’s arm won them the first game, but Carolina’s identity on offense was grounded in Stephen Davis. “It wasn’t like we were setting the world on fire throwing the football,” Delhomme says. “We really rode Stephen.” Davis hit the 100-yard mark against Jacksonville, but it was the next week, when he gained 142 against the defending champion Buccaneers that Delhomme knew their running game had a chance to be something special. Davis finished the season with 1,444 yards. The Panthers beat Tampa Bay in overtime, and then Atlanta, and then New Orleans, and Peyton Manning’s Colts — again in overtime. They were 5-0, and by the halfway point, in control of a mediocre division. The rest of the NFC South was bad enough that Carolina had it almost in hand by late November, something Delhomme says did more harm than good. They lost three straight games in Weeks 12-14, including one in Philadelphia that involved three missed field goals. “There was a sense that we were pressing and not playing,” Delhomme says. “When we eventually did clinch, it was like a weight was lifted off our shoulders.” Two years removed from a 1-15 season, the Panthers were going to the playoffs. The 2003 Rams weren’t quite the Greatest Show on Turf. Kurt Warner was lost for the year early on, and Marc Bulger wasn’t quite Kurt Warner. Still, the Edward Jones Dome was a beast of an away game in the playoffs, something Proehl knew well. When St. Louis went to the Super Bowl in 2000, it was Proehl who sent them there, with a game-winning touchdown catch in the NFC Championship Game. A week later, the Panthers traveled to a chilly, windy Philadelphia as four-point underdogs in the NFC Championship Game. The complexion of the game was scrambled early on, when Donovan McNabb separated his rib cartilage, sending him to the sideline to be replaced by Koy Detmer. “The life got sucked out of that stadium,” Delhomme says. The Panthers pounded the ball on the ground, running on 40 of their 54 plays, on their way to a 14-3 win that, in comparison with the rest of their season, felt like a blowout. The week before the Super Bowl, John Fox kept his players at a golf resort about an hour outside Houston. “We still bust the guys’ chops about that place,” says Proehl, now the Panthers’ wide receivers coach. “The guys that set that up are still here. I bring it up at least once a year.” Musty and worn down, the place looked like it hadn’t been used in about five years. The players’ quarters resembled dorms, with four rooms branching off from single common areas with a TV in the middle. It was something more fit for a middle-school basketball squad than NFL players preparing for the biggest day of their professional lives. With 1:14 left in the second quarter, and in the middle of a drive that started at his own 3, Delhomme faced a third-and-10 at the Patriots’ 39. The call in the huddle was a “check with me” run-pass option, contingent on how New England lined up on defense. When Delhomme saw the single high safety and Tyrone Poole lined up in man coverage on Steve Smith, he had his answer. Proehl came to Carolina familiar with great receivers. Isaac Bruce and Torry Holt made up one of the best duos in NFL history, but Steve Smith — well, Steve Smith was different. “He’s the most competitive receiver I ever played with. That’s no disrespect to Isaac or Tory. Steve wanted the football, and he’d go after it,” says Proehl. In his second full season as a wide receiver, Smith finished with 1,110 yards on 88 catches, becoming one of the most dynamic forces in the game. When Delhomme took the snap and saw Poole a half step behind, he couldn’t get rid of it fast enough. “If Steve was even, he was leavin’,” Delhomme says. The touchdown tied the game at 7. In a blur, another Patriots score and a Panthers field goal made it 14-10 at the half. Carolina wasn’t even out of the locker room when news of Janet Jackson’s exposure started making the rounds, but the most controversial moment in Super Bowl halftime history was followed by a third quarter almost as dull. Just as they had in the opening quarter, both teams went scoreless. Then the fourth quarter — and the fireworks — began. New England scored quickly, with an Antowain Smith touchdown to make the game 21-10. After a stop, the Pats were marching to score again. Tom Brady had his team in the red zone with a chance to end it when Reggie Howard picked him off in the end zone to keep the game alive. A 33-yard run by DeShaun Foster, who finished it off with one of the most memorable Super Bowl images ever — a flying, one-hand soar into the end zone — cut the lead back to five. After Muhsin Muhammad’s 85-yard touchdown put Carolina ahead, Brady answered with a drive capped off with a short strike to Mike Vrabel. On the ensuing kickoff, the ball left John Kasay’s foot and bounced out of bounds. With just over a minute left, Tom Brady needed only 25 yards to get into Adam Vinatieri’s field-goal range. On a third-and-3 from Carolina’s 40, Brady threw a strike to eventual MVP Deion Branch for 17 yards. And with that, Vinatieri trotted out on to the field hoping to finish off Proehl’s twisted déjà vu. “I wanted to hate him,” Proehl says of Vinatieri. That feeling was dashed when the two finally met in Indianapolis three years later, when Proehl signed with the Colts and eventually won his second Super Bowl. In the final moments of Super Bowl XXXVIII, Proehl was holding out hope that the slick surface might be enough for Vinatieri to slip and hook one like he had earlier in the game. Proehl would find out later that Vinatieri had changed shoes midgame. His footing was fine. The kick was always good. Unlike Proehl, Delhomme doesn’t remember where he was standing when the ball went through the uprights. Those final moments are a blur. The blow was devastating. “I don’t think there was ever a point in time when we felt like we were not going to win the football game,” Delhomme says. This post has been updated to correct an error. It was Koy Detmer who replaced Donovan McNabb in the 2003-04 NFC Championship Game, not Ty Detmer.